It’s been a cold winter across most of Alaska. It’s not the first and it won’t be the last. During every winter there are relatively colder and warmer periods. This year these cold snaps and warm spells seem to be aligned pretty well to the calendar months: November was cold, December warm, and January…one of the coldest, especially for the rail belt and everywhere west. Check out the write-ups from Weather Service personnel in Anchorage http://pafc.arh.noaa.gov/papers/THE%20COLD%20FACTS.pdf and Fairbanks https://nwschat.weather.gov/p.php?pid=201202012052-PAFG-NOAK49-PNSAFG. February is staring off with a big warm-up, thanks to a strong low barreling into Alaska’s midsection like a gut punch. I’m not making any promise that this trend will hold for February. It does look like a week to 10 days’ break for from the cold, but beyond that, I’d be surprised if we don’t get a fair amount of more cold weather (and snow for the coastal and near coastal areas) before the winter is over. See the Climate Prediction Center for more. For this post, however, I want to zero in on an interesting pattern that seems evident during the worst of the cold snaps. Let’s start with this map, used by permission of the Anchorage Daily News. The figures show the coldest temperature (degrees F) endured at each city over this past weekend (28-29 Jan). The pattern that jumped out at me is the “warm” Fairbanks surrounded by a bunch of colder towns and villages. Now, I’m not about to make any conclusions based on this one case, but stay with me and I think I can make some sense of this, at least to whet the appetite for further study. 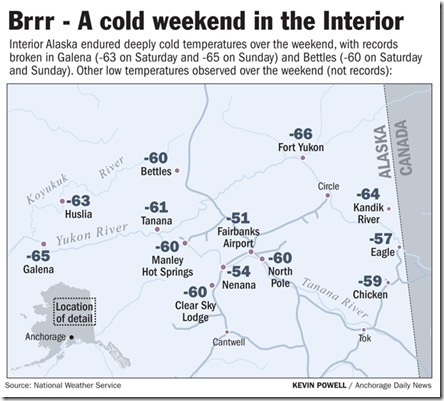 About the map–you might point out the Nenana was not much colder than Fairbanks, and after all, some places are just colder than others. To check that idea, I’ve tabulated the long term averages for the stations on the map (some did not have enough data, so I’ve added Hughes to stand in for Huslia, and I also added McGrath for reasons which will become apparent). The columns on this graph show the number of days during the given winter that the temperature dropped to –50 F (-45.5 C) or colder, red for Fairbanks, blue for McGrath. The jerky lines above are temperature observations for each station (same colors), showing the average of daily lows for December, January and February for the given winter (December of the year previous to the label). The average lows track as you would expect: each of the two stations follow the ups and downs of the 70 winters in fairly close agreement to each other, or with Fairbanks being a few degrees cooler. The number of –50 or colder days is fairly close as well, through about 1971. In fact up till then Fairbanks has more of the super cold days than McGrath, but that’s nothing unusual since Fairbanks is colder on average–the line graph clearly shows that–and in the winters that Fairbanks had significantly more –50 days (1965 & 1969) their DJF average was significantly lower as well. What begs an explanation is the lack of –50 days after 1971. 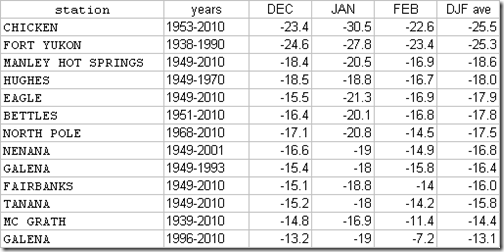 There is no change in the relative DJF temperatures (almost all the –50 days occur during those three months). Yet from 1971 onward, McGrath has had many more 50 below days than Fairbanks, even while their average temperatures have been very close to or a bit warmer than Fairbanks. In fact, the rate of occurrence of days 50 below or colder does not change much for McGrath or the 4 other interior stations you can see in the supplemental file, but at Fairbanks it drops by 4/5ths! Why would the UHI effect be so evident for extremely low temperatures when it is fairly weakly reflected in average low temperatures ? Several factor present at average low temperatures are sharply increased in the extreme cold. During cold snaps, temperature inversions are sharper and winds tend to be lighter, meaning local effects are not diluted as much by mixing with surrounding air. The colder it get, the more energy must be used to heat buildings, keep cars running, etc., and so the more waste heat enters the atmosphere. The more fossil fuel consumed, the more water vapor and particulates enter the atmosphere, releasing latent heat though condensation, freezing and deposition. This last item is crucial, but might need some more explanation. When carbon based fuels are burned, the primary byproducts are carbon dioxide and water vapor. There is a lot of energy in water vapor, a potential kind of energy called latent heat. This is an important lesson in Meteorology 101. The latent heat is put there by the sun when it evaporates water, or, in this case, by the heat of combustion. There is very little water vapor in the frigid winter air of uninhabited interior Alaska (almost none) since there is so little heat available to convert or keep the H2O in vapor form. Of course there is very little liquid water to be found lying around either, for the same reason…not enough heat to keep molecules moving enough to stay liquid. But in a city the size of Fairbanks, with water vapor flowing out of every smoke stack, power plant, furnace flue, exhaust pipe and jet engine, there is quite a bit, and it does not want to stay gaseous long. At moderately cold temperatures (+10F down to around 25 or 30 below 0F) it often makes liquid water fog, which often gets mixed into drier air and turns back to vapor, or become rime or frost on solid objects. Sometimes, if the right kind of particulates are at hand, (remember how burning fossil fuels releases particulates: smoke, etc.) it can form ice crystals in the air which gives us those brilliant halo and sun dog displays. All these instances of water changing to a lower energy state release heat. And when fog or clouds are formed, the fog or clouds can also retard heat loss due to radiational cooling of the ground. But often it keeps getting colder despite these effects. So, the colder it gets, the more moisture is put into the air by humans trying to keep warm or keep their vehicle or aircraft engines running, but the less moisture the air can keep in vapor form. Around –40 (F or C) and colder the liquid and gas phases are basically no longer available to H2O. It’s getting squeezed out of the air as fast as it can be put in, and the result is usually ice fog. And lots of latent heat, since there are two phase changes to get to the solid ice particles that make up ice fog. So let’s look at the recent cold snap and see the difference in moisture issues between Fairbanks and much smaller, but usually warmer, McGrath. Last graph, I promise. Look especially at the temperature changes. In Fairbanks, when it dropped below about –45 F, the visibility dropped to 1/2 mile, then 1/4 mile or less…ice fog. With the fog thick and constant for the next day and a half, the temperature did not get much colder—nor warmer. In McGrath, the visibility only dropped for short periods and not as drastically as Fairbanks, despite even colder temperatures at the low end. There was less water vapor being put into the air, less fog, and less latent heat release and less to hinder radiational cooling. During the afternoons, the lack of fog allowed some warming due to a little sunlight, though on the 29th it looks like the warming was due to other reasons. If your fingers and keyboard are not too stiff from the cold, type in your comments or questions below. I’d love to hear your thoughts. Why does it seem the change happened abruptly around 1971 when the population of Fairbanks shows a fairly steady rise over the years? Population is just a proxy for the amount of fossil fuels burned. There could have been other factors that boosted the UHI emissions faster than the population. In the mid 70s there was a large influx of population and perhaps a relatively larger upswing in emissions from burning fossil fuels due to the Trans-Alaska Pipeline construction. Or perhaps there is a critical size when these effects show up. What other factors might be at work? We can’t rule out problems with the observations. There have been changes to the instruments and their siting in Fairbanks, some with suspected problems for the data. See http://climate.gi.alaska.edu/history/Interior/Fairbanks.html for more information. Speaking of problems with observations, did you hear about the -79 F temperature reported from Jim Creek that garnered media attention? The NWS was right to throw it out, and throw it far. Records can’t be accepted by stations not certified as to meeting NWS standards and calibration. That does not mean every observation that is not “official” is wrong, but this one clearly was. When the really extreme cold snaps hit, all stations in the area (except Fairbanks) usually drop to similar extreme temperatures. Another excellent post! – thank you. I think your hypothesis is a very reasonable explanation for the recent inability of Fairbanks to get much below -50 F.
I did a few quick back-of-the-envelope calculations and it seems the magnitude of the latent heat release from condensation and freezing of water vapor is probably sufficient to make the difference you have observed. Assuming conservatively that per capita energy consumption under these conditions is three times the annual average for Alaska residents, we get an estimate of 100 million kWh per day in Fairbanks during a cold snap. If we assume this all comes from fossil fuel combustion locally, the energy release from water vapor condensation and freezing is very roughly 100 trillion Joules per day. Finally, if all this heating is confined locally, and the volume of modified air is a 10 km radius circle with 100 m depth, it would be warmed by about 3 degrees F per day. This assumes that the only water vapor emissions are from the combustion process. But from what I have been reading, fossil fuel power plants can produce as much as 5-10 times as much water vapor from evaporation of cooling water as from combustion. So my estimate could be much too low. Thanks for your fascinating analysis of the historical data. Thanks, Richard for the number crunching! Here’s a related question I’d like to answer if I can find the time or talk someone else into doing it: What are the relative amounts of water vapor produced by burning the various fossil fuels, gasoline vs diesel vs Propane vs natural gas. The reason is that different cities use them in different proportions. For instance Anchorage and Barrow use a lot of natural gas since they have local sources, whereas I think Fairbanks uses mostly heating oil (diesel). It might be interesting in light of Barrow’s large Urban Heat Island effect. Based on the reaction equations and molecular masses, they show that natural gas produces nearly 60 percent more water vapor than crude oil (and diesel oil should be comparable to crude oil). Their numbers also indicate that natural gas contains slightly more (11 percent) energy by weight than oil, so less gas would need to be burned than oil; but gas still produces far more water vapor per kWh. Interestingly the Barrow UHI study you cite shows a strong correlation between the monthly heat island magnitude and the natural gas usage (because gas usage goes up with colder weather).